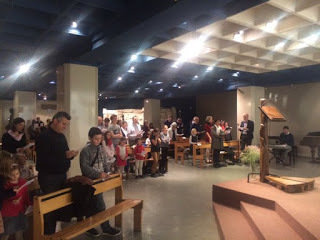 In the aftermath of the deadly attacks in Paris, the Community of Sant'Egidio of the French capital gathered in the chapel of Saint-Bernard in Montparnasse. Prayer, as the Pope said at the Angelus, avoid people to be closed in walls made of fear and blind revenge: "Do you know how to avoid the walls? We must speak out, pray and serve." Prayer in memory of the brutally killed victims, for peace, for the end of the terrorist violence, means to keep hoping, to keep saying "No" to those who want to destroy the miracle of living together.